After gilding, the first step in creating the patina is to start the distressing process, replicating worm holes and adding distress lines with a razor blade. The soda wash is created by mixing six tablespoons of Arm & Hammer Super Washing Soda to six ounces water. so by painting over the gold or by using gessoed-only frames they were very avant garde. But to sell these master-pieces at a high dollar price, even in the Fifties and Sixties, the patrons and the galleries decided the frames needed a little help. And that is where the wonderful French soda finish was born. First, be warned that you can lose a frame very easily with this technique. You’ll be working on unsealed gold, so pay attention and don’t walk away from a frame between steps. 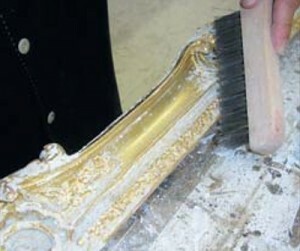 Brushing the soda wash on is easy—as long as you don’t forget all the nooks and crannies of a French frame. For this project, I wanted a really beautiful French sweep with carved corners and centers for this patina. 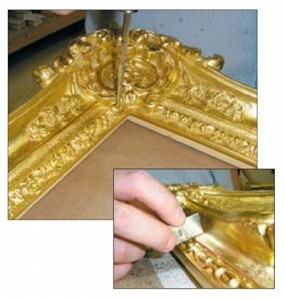 So, I called Rhonda Feinman, who suggested a 3″ Louis XV closed corner frame with small centers. She sent it in gesso with ornaments all re-carved, sanded, and ready for clay. We sprayed it in yellow clay and glazed on three light coats of red/orange clay. The wash is then tamped with a rag and cotton waste. After that, stand back and watch as the wash starts to etch the gold. grocery store or hardware store that carried it. Through the Internet, we found it at Gristedes in Manhattan. I should have remembered this, but age is catching up with me. Well, enough nostalgia. The washing soda is sodium carbonate. When mixed with water, it turns from a liquid to a corrosive solid that eats away the leaf. miss anything. Tamp it back with a rag and cotton waste and stand back and watch. 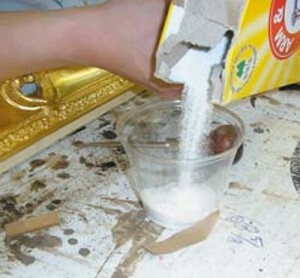 Because the washing soda is sodium carbonate, when mixed with water and put on gold it starts to turn from a liquid to a corrosive solid that eats away the leaf. It is a wonderful acid wash and when dry you can go at it with all sorts of tools. We tried wet steel wool and rasps at first, but we found that a steel brush worked best. When dry you can go at the finish with all sorts of tools, such as wet steel wool. frames. 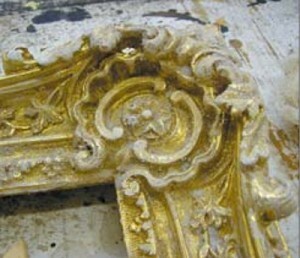 So, by using the soda you can get a crossover between a white painted frame and a gilded frame with white in the carves. 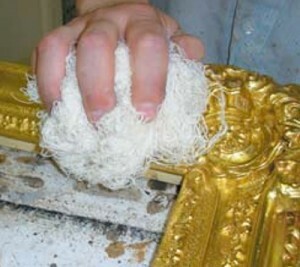 Using a steel brush worked best to control the rub and how much white is removed. 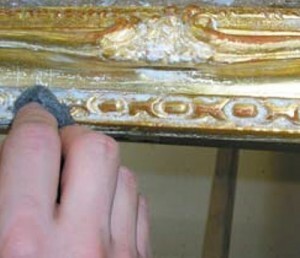 After brushing, you can see how soda creates a crossover between a white, painted frame and a gilded frame with white in the carves. thinned it with a clear liquid wax to keep the translucency of the patina. 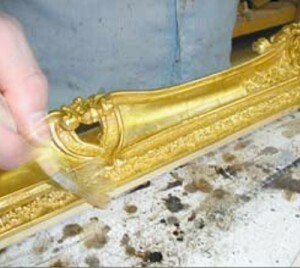 But the look of the frame with the white left in the carved areas was a little harsh. So, as the story goes, the Wildenstein Gallery suggested toning down the white with pink dust to work with a specific painting. 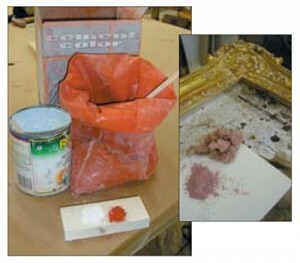 To make pink dust, mix red cement color with whiting. Well, you can see what a wonderful patina this is. 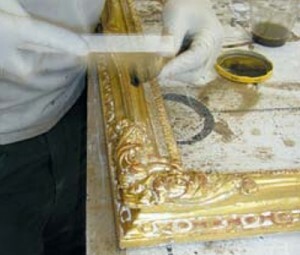 It’s a shame that I only get an opportunity to do a frame with a French soda finish and pink dust every 30 years. Next, the surface is spattered with raw umber artist pigment and clear shellac thinned with denatured alcohol. 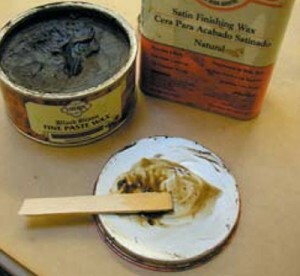 A colored wax in medium oak, thinned with clear liquid wax to keep the patina translucent, was applied to enhance the light pastel finish. 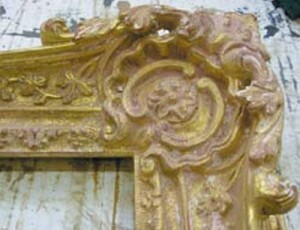 The white in the carved areas of the frame was then toned down with pink dust made by mixing red cement color and whiting. 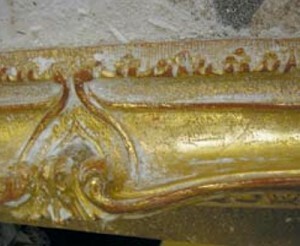 A close up of a corner ornament shows the final result of creating this wonderful patina with soda wash and pink dust.